YouTube is one of the most popular social networks, because students love learning by video. DIY (Do It Yourself) videos, How-To videos, Tutorials, game walkthroughs and TED Talks are some of the most viewed videos. People enjoy learning from others who walk them through the process. The content is shorter and dynamic. Plus, students can learn from a multitude of subject matter experts worldwide. Below are web tools and apps for teaching with videos. If you’d like to get your students to create their own video walkthroughs or tutorials then check out my book, Hacking Digital Learning Strategies: 10 Ways to Launch EdTech Missions. 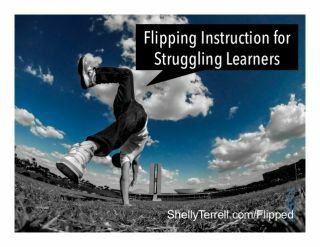 For more ideas on flipping instruction with video, check out my presentation, Flipping Instruction for Struggling Students. Edpuzzle and PlayPosit are two of the most popular educational tools for creating video quizzes and assessments. Both offer free versions for instructors with features for quick grading and assessment. Recap is an educational question-led video chat tool which works on any device (web/app) and provides teachers with tools for quick feedback and assessment. Access a variety of ready made lesson plans. ISLcollective and ESL Video are free web tools to create interactive video quizzes for English language learners. Other great free web tools to create interactive video lessons and quizzes, include Quizbean, Vizia, Video Ant, and iSpring. With Google Forms you can include questions for a video or create other assessments. You can use the DocuTube add-on to embed a YouTube video in your Google Docs. With Vialogues you can have discussions about a video and post questions within that discussion. Buncee, TES Teach, and Educlipper (web/iOS app) are education tools for creating lesson boards with video or other multimedia content and including various types of assessments. Seesaw (web/app) offers various assessment options for teachers, including ways to create interactive video lessons. Find several video lessons based on inspiring TED Talks at TED-Ed and create your own!